All of my tea parties have arrived at their destinations and the weather here has finally cooperated so I can enjoy my own tea! I love sitting in my garden. It's still a wilderness since most of our efforts are indoors presently but it doesn't matter to me about the weeds and brambles. Just to enjoy the blue sky and hear the birds sing is bliss to me. For the past week or so we've had drizzles, or gusty winds and when you have to wonder if your table cloth is going to take flight or you'll have to sit under an umbrella, it's better to wait to have your tea party. Today is an idyllic day with blue skies, puffy white clouds and just the hint of a breeze. I found a nice spot in the shade to put my table where I would enjoy my tea. The small orchard we have is underplanted with daffodils and while we wait until they are ready to be cut, the area turns into a glorious meadow full of wildflowers and tall grass. It's mesmeric watching the meadow gently rock in the breeze. Butterflies and bumble bees go happily about their business as I sit and sip. 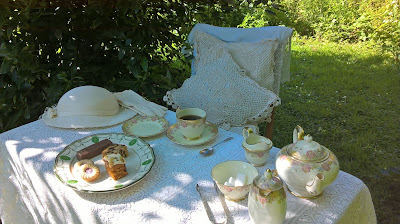 Long after my tea was finished I sat at my little table writing. I'd brought my letter writing things out with me and wrote letters to friends and pen pals while I drank my tea. I lingered quite a long time, loathe to break the spell of contentment. I've been getting letters from my guests and Mrs. Duffy has talked about her tea party experience here. It's nice to hear how everyone has enjoyed the tea party. Even though miles separate us we all meet over a cup of tea. Thinking of you today as you enjoy your tea. My tea party lasted several days, thanks to you! I replied to your lovely letter while I enjoyed my tea so I shall put that in the post when I go to town next week. I'm pleased you enjoyed your tea party parcel.